Does this surprise you? Obama has been defending the Muslim communities and the Islam faith, and not defending this country against ISIS. 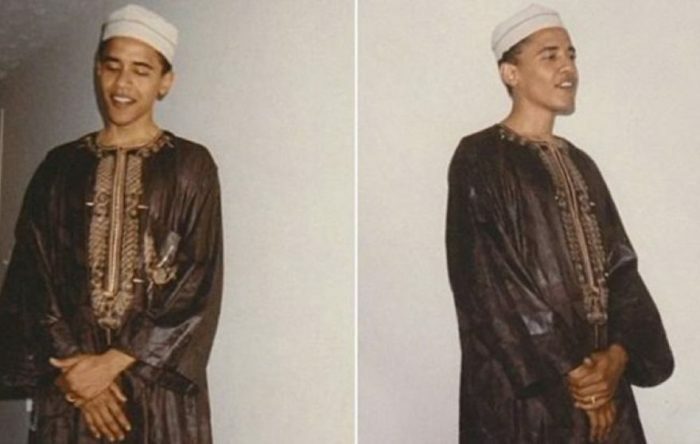 Newly unearthed photos of President Obama in Muslim garb underscore his deep ties to the faith — and possibly help explain his reluctance to call out radical Islam, Fox News Channel’s Bill O’Reilly said Wednesday. The photos, aired on “The O’Reilly Factor,” were taken at the wedding of Obama’s half-brother, Malik Obama, in Maryland sometime in the early 1990s, O’Reilly said. They were not offered as evidence that Obama is Muslim, as some of his critics insist, but to show his “deep emotional ties” to the religion of his father and stepfather, O’Reilly said. “There is no question the Obama administration’s greatest failure is allowing the Islamic terror group ISIS to run wild, murdering thousands of innocent people all over the world, including many Muslims,” said O’Reilly. “Mr. Obama has never, never acknowledged that mistake, nor does he define the ISIS threat accurately. “On the very day that Senator Clinton is giving a speech about restoring respect for America in the world, her campaign has engaged in the most shameful, offensive fear-mongering we’ve seen from either party in this election,” then-Obama campaign manager David Plouffe said.